John C. Oxley’s Airoforce swung wide at the head of the stretch and powered home in his dirt debut to win the 89th running of the $200,000 Kentucky Jockey Club Presented by TwinSpires.com (Grade II) by 1 ½ lengths over 2-1 favorite Mor Spirit on a rainy Saturday afternoon at Churchill Downs. Airoforce, the winner of Keeneland’s $250,000 Bourbon Stakes (Grade III) who was beaten a neck by fast-closing Hit It a Bomb in last month’s $1 million Breeders’ Cup Juvenile Turf (GI), ran 1 1/16 miles over a “sloppy” track in 1:45.48. Julien Leparoux rode the winner for trainer Mark Casse. The Frenchman rider also piloted 2-year-old filly Carina Mia to win the $200,000 Golden Rod Presented by TwinSpires.com (GII) in 1:45.42 two races earlier. 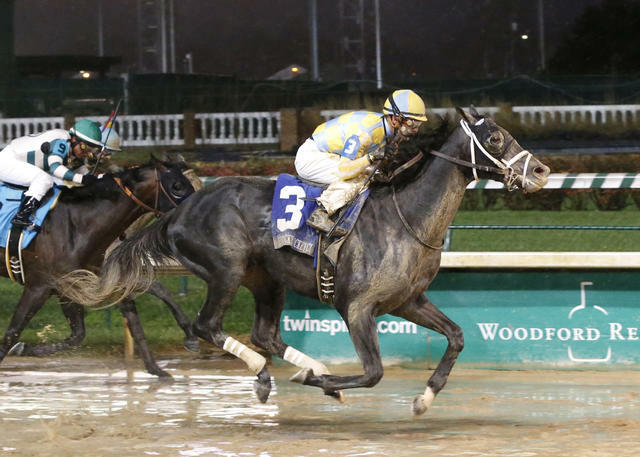 Airoforce collected $114,800 and 10 points as part of the 35-race “Road to the Kentucky Derby” series, which offered points on a scale of 10-4-2-1 to the Top 4 finishers as a “Prep Season” race. Overall, he’s won three of four starts with one second. His earnings stand at $516,800. Airoforce, who raced with blinkers for the first time, was positioned in mid-pack as 32-1 longshot Derby Express and trainer Bob Baffert’s California invader Mor Spirit led the field through fractions of :23.50 and :47.61. Mor Spirit took command on the far turn with the Steve Asmussen-trained allowance winner Gun Runner in close pursuit as Airoforce began to weave between horses from fifth position. As Mor Spirit and Gun Runner engaged, Airoforce swung wide and the trio battled down the lane with Airoforce clearing in the final stages. Mor Spirit, who lost the lead from Gun Runner briefly in deep stretch, battled back for the runner-up spot and held off a fast closing Mo Tom by a head. Gun Runner ended up another 1 ½ lengths back in fourth. Annual Report, the Kiaran McLaughlin-trained Futurity (GII) winner, was another two lengths back in fifth. My Majestic Flight, Perfect Saint, Tom’s Ready, Rated R Superstar, Nana Looch, Derby Express, Force It and Uncle Jerry completed the order of finish. Discreetness was scratched. Airoforce paid $9, $4.20 and $3.20 as the 7-2 second betting choice. It was the second Kentucky Jockey Club victory for the Oxley and Casse combo – they teamed to win the 2012 Kentucky Jockey Club with Uncaptured –and a record-equaling fourth overall for Oxley, who also won the KJC with Jambalaya Jazz (1994) and Beethoven (2008). Mor Spirit, ridden by Martin Garcia, paid $3.40 and $3.40. Mo Tom, who went to post at odds of 16-1 under leading rider Corey Lanerie, returned $7.80 to show. Airoforce, a son of Colonel John out of the Cuvee mare Chocolate Pop, was bred in Kentucky by Stewart M. Madison. One race earlier, the Casses saddled another promising 2-year-old when Conquest Stables LLC’s Conquest Big E won a first-level one mile allowance/optional claiming event in 1:37.62. Each of the 12 races on Saturday at Churchill Downs was exclusively for 2-year-olds that may have aspirations of trail-blazing their way to next spring’s Kentucky Derby Presented by Yum! Brands and Longines Kentucky Oaks. Inaugurated in 2005, “Stars of Tomorrow” programs have helped launched the careers of numerous graded stakes winners, including 36 Grade I winners and 23 millionaires led by 2010 Kentucky Derby champ Super Saver; 2011 Preakness and 2012 Met Mile and Clark Handicap winner Shackleford; 2009 Horse of the Year Rachel Alexandra; 2012 Breeders’ Cup Classic and 2013 Stephen Foster Handicap hero Fort Larned; 2012 Kentucky Oaks winner Believe You Can; and 2013 champion 3-year-old Will Take Charge. Racing at Churchill Downs resumes Sunday with a 12-race card for closing day of the 21-day Fall Meet. The first race is 12:40 p.m. EST. Corey Lanerie enters the program with a 30-18 lead over Robby Albarado and Ricardo Santana Jr. in the jockey standings. Steve Asmussen has an 11-10 lead over Chris Richard in the trainer standings with Brad Cox and Mike Maker not far behind with nine wins each. Ken and Sarah Ramsey lead all owners with nine victories, three more than Midwest Thoroughbreds Inc.
NORMAN CASSE, trainer of AIROFORCE (winner): “The Kentucky Downs purse structure makes it very hard to not run there. He was, all summer, one of our better 2-year-olds that we kept down here and it just seemed natural to run him at Kentucky Downs because he could run for the bigger pot. 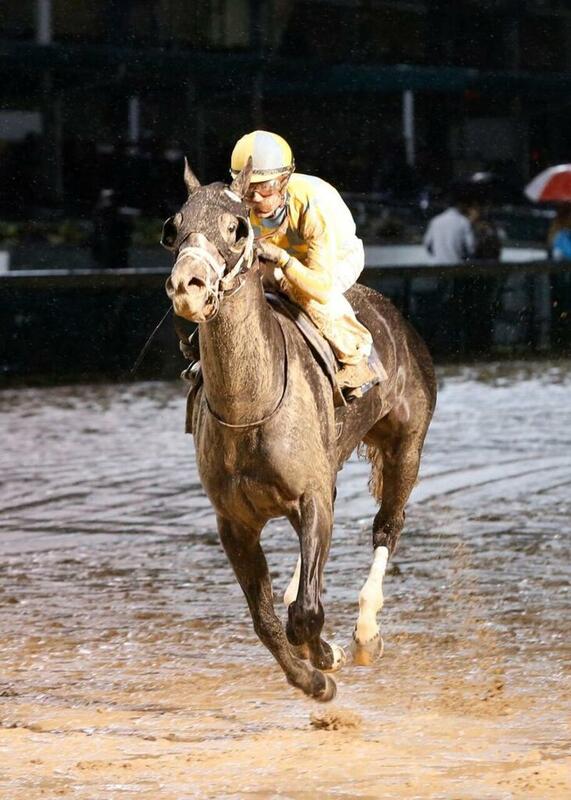 That being said, he was always one of our better horses and we knew that he liked the dirt it was just a matter of getting him on it when the time was right and tonight was the best time to do it. “We’re certainly excited. We got to hold our optimism a little bit because this was a sloppy racetrack and it wasn’t necessarily a fast main track. 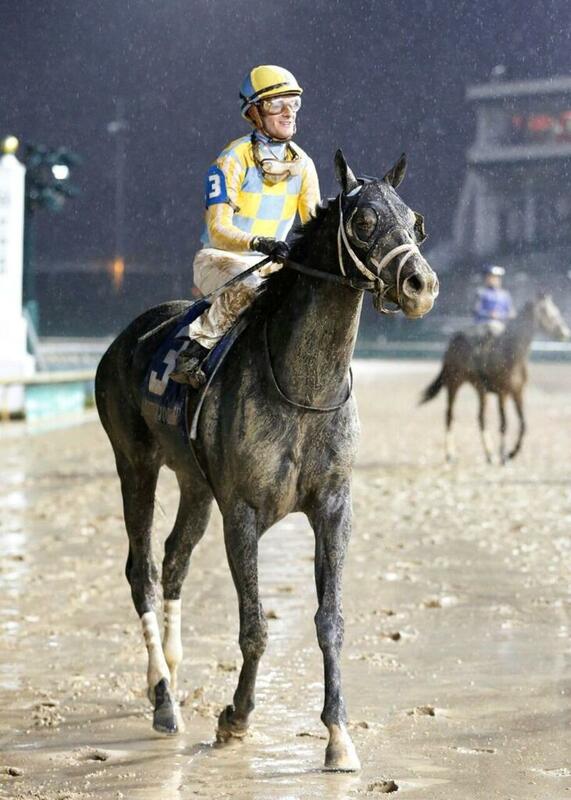 That being said, he won at Churchill Downs and he did what he was supposed to do. I thought this was a tough race this year. I’m excited about the way he ran. JULIEN LEPAROUX jockey of AIROFORCE (winner): “It’s been a good day. Coming into today, I knew that I had two nice horses in the stakes. They both ran really well. He always worked well in the morning. He’s good on anything; we’ll just have to see on the fast track how good he’s going to be. 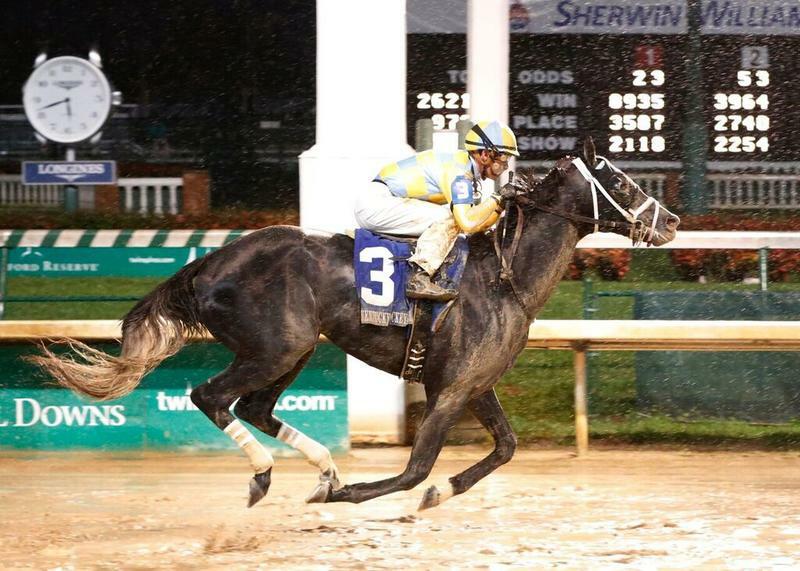 To view a pdf of the updated Road to the Kentucky Derby Leaderboard, click here .